St. Albans, New York, January 14th, 2014 - Jazz talent has always found a home in St. Albans, Queens, New York. It is rather well known that jazz legends like Lena Horne, Ella Fitzgerald, Fats Waller, Count Basie, and John Coltrane to name just a few, lived in St. Albans, at one point in their lives. Ironically, there has been lack of quality establishments in the area that have been receptive and classy places to showcase jazz talent in St. Albans, Queens - until now! Enter jazz artist and financial entrepreneur Edward Jackson, who has recently built a quality jazz hall underground to showcase jazz in an above board big way in St. Albans. His new Jackson Room jazz hall was built, with a lot of hard work and dedication to the art form, in the basement of his building also housing the well respected Jackson Tax Service. The last gig at Jackson Room, "End Your Year on a High Note!" was a successful and uplifting heartfelt homage to the holiday season. In this regard, Mr. Jackson and his staff want to continue to go into this New Year with the same elevating energy and intensity focusing on our rich musical culture. January and February are very important months because we give pause to remember the contributions of Rev. Dr. Martin Luther King, Jr. and also our ancestors in celebrating Black History Month. "During January and February (Black History Month) we will be celebrating our contributions to the American Art form Jazz" says Jackson. We will play music from African American composers who were instrumental in creating this original musical artform. Some consider jazz the only truly original American musical art form and of course its roots began in the rhythmic soulful expressions of our ancestors in places like New Orleans and the Deep South. 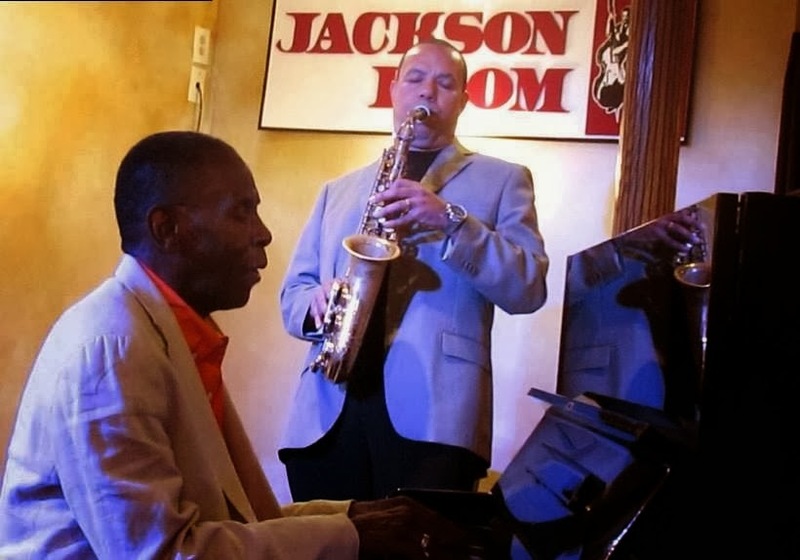 In the great historical migrations of Black people moving into the Northern Cities St. Albans, Queens, the town where Jackson Room is located, was a home of some of the most preeminent artists in jazz. If you live in South Queens this is a musical treat you won't want to miss. "Jazz is Instrumental Black History Month"
New York, New York, January 12th, 2014 – Dr. Yolanda Webster looks at people as gems or in fact diamonds ready to shine forth with Spiritual beauty. Her dream of becoming a motivational author and inspirational writer is within grasp and crystallizing like a precious stone being formed out of the coal. 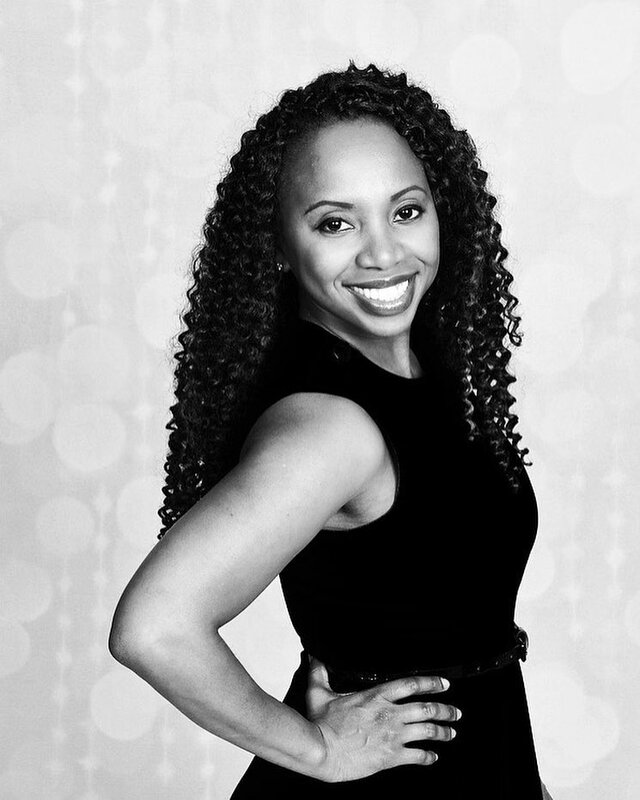 Webster a respected musical educator from the prestigious Columbia University music program is on a mission to use her God given talents and aplomb to encourage others to push forward in life. To Webster, hearing how others are inspired by her mentorship, Christian service and published books is music to her ears. 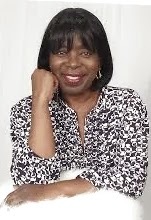 Dr. Webster is CEO of Diamond Enterprises Inc., an inspirational publishing company. Webster, who grew up in the Black historic urban enclave of Bedford Stuyvesant knows how to rise to a challenge in life, persevere, and make a difference. She affirms her deep Christian roots as being an important source of her resiliency and resolve “some of the greatest lessons I've learned in life on how to succeed are that God has a purpose and a plan for my life and His plan for me is only for my good.” Dr. Webster is determined to encourage those who are ill and in need of a helping spirit. This is a part of who she is naturally and her core beliefs “I overcame formidable challenges in life because I took the focus off myself and focused on the greater good for other people” she reveals. Dr. Webster has had her bouts with illnesses and uses music as a way to heal sick and infirmed souls that she empathizes with in her ministry. While some may be skeptical about the need for yet another motivational guru in a world full of them Dr. Webster isn’t at all dissuaded. Her confidence can’t be rattled because of her abiding faith in God. She says with certainty “He loves me and wants only the best for me. He already began this work in me and promises to complete it. 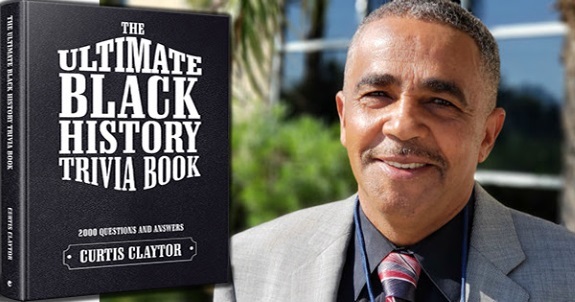 I'm in partnership with Him.” If Dr. Webster can continue to bring her unique skill set and compassion together to continue to inspire others her efforts will set the stage for some melodious motivations in the inspiration book publishing genre. January, 20th , 2014 South Queens, New York - Many African American boys have been inspired to read and expand their minds by comic books. Black males have supported the superhero genre in both classic comic books and more recently blockbuster movies. Understandably, in response to multi-ethnic support of comic books the mainstream comic book media, out of enlightened self interest and marketing savvy, have created a shortlist of superheroes of color. Superheroes of color and black superheroes in the mainstream comic book media have been sporadic or divergent with major players like Marvel and DC comics. However, Black superheroes like the Black Panther, Luke Cage, Blade, and Spawn to name a few, don’t organically delve into the throes of Black male experience some would argue. They certainly don’t delve into the complexity or reflect the nature of the Black perspective or experience. However, a creative and socially aware comic book company and supporting fashion line are looking to change this paucity in comics. Trapper Boy Chronicles, the comic book creation of entrepreneur and publisher known as Bro. Wise El, is poised to send ripples through the comic book industry. Trapper Boy is different than most Superhero comics in that the protagonists don’t possess super powers. Also Trapper Boy is a bit different than traditional comics where the scenario is combative futuristic dealings with despotic authorities or criminal elements. Instead the Trapper Boy Chronicles franchise more profoundly delves into inner city urban social throes in a more realistic and organic way than previous comic publications. Trapper Boy is derived from the concept of the vicious cycle of life and survival many people find themselves on. According to the publisher, “The term "trap" symbolizes that proverbial "hamster wheel" that many of us have ran on and continue to run on, to keep our head above water. Any hustle or grind that helps sustain the basic necessities of life can be termed a "trap". While the challenging social dynamics of urban communities is sometimes the backdrop of Black comic book characters in mainstream comics, Trapper Boy Chronicles also posits its controversial perspectives as the raison d'être for economically challenged communities. This is a subtle but nevertheless monumental and radical departure for the Black comic book genre with Trapper Boy Chronicles. Trapper Boy doesn’t shy away from sensitive inner city issues like police corruption and brutality, judicial system injustice, racism, and government cooptation or malfeasance. The Trapper Boy Chronicles are the creative expression of its publisher Wise, and his roots and concurrent experience on the tough streets of Queens, New York. He grew up in the demanding home town of rapper 50 cent and the infamous Lorenzo “Fat Cat” Nichols. Wise also sold drugs, did a stint in the military, and practices martial arts. 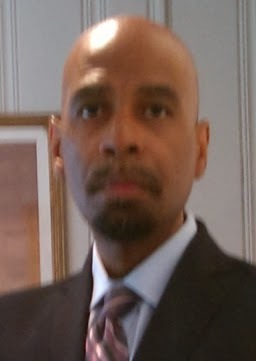 He feels his “life long experience on the proverbial hamster wheel qualifies him as a writer of this subject matter.” He also studies religion and culture with groups like the Nation of Islam which gives him a unique rich tapestry of knowledge to paint his comic book series. If Wise is successful with his Trapper Boy Chronicles franchise the comic book genre will be profoundly challenged and changed. He will quite possibly inspire and awaken young people to change their circumstance and station in society. Trapper Boy Chronicles looks to not only make a statement in print and digital media but also create a line of statement clothing or aware ware. 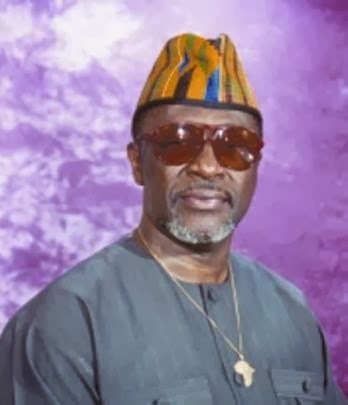 I'm was sorry to learn that Elder John Watusi Branch, the legendary founder of the respected African Poetry Theatre, passed away right before the New Year. John was instrumental in being a mentor to me in my search for cultural awareness along with countless other people in the South Queens and NYC area. He pointed me in the right direction as an activist and person of faith and exposed me to countless progressive ideologies. He also was gracious and hosted some of my seminars back in the day with luminaries like the late Dr. Ivan Van Sertima, Cornel West, Charles Barron and Rev. Dr. Herbert Daughtry. He will be sorely missed but takes his regal seat with the ancestors today. Here were the Details about the Home Going Ceremonies for Elder John Watusi Branch. His Memorial Service was: Sunday Jan 5th 2014, 11am-4pm and his home going services were at: Jamaica Performing Arts Center, 153-10 Jamaica Ave, Jamaica NY 11432. The Viewing of the Baba Watusi was Sat. Jan 4th 2014, at The Afrikan Poetry Theatre. I hope there is a transition team in place to take over the African Poetry Theatre. It was a invaluable cultural institution in the community and I hope it continues. The Southeast Queens community really needs his institutional legacy to continue. 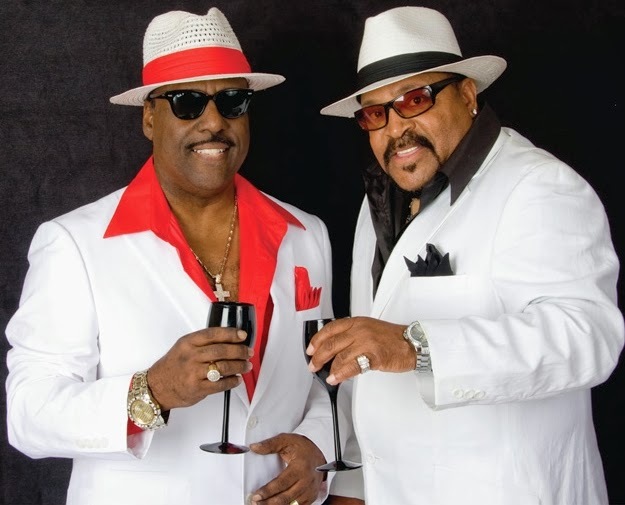 Skip Broadley Jr., and Charles Morais have worked with some of the top legendary luminaries in music including the Jackson 5, Crown Heights Affair, the Spinners, the Commodores, and Kool & the Gang just to name a few. Morais, has contributed to a body of music with his diverse music skills and talents writing the dance classic “Body Music” which was on Prelude Records. He also played keyboards for the Strikers. He is a former keyboard player with the Crown Heights Affair. Charles is furthermore a former keyboardist for Made in USA, formerly signed to Delete Records. These two established music industry insiders are now collaborating on independent musical expressions and “Tribute to the Ladies” is their 1st single created to affirm and lift up women. And many in the industry ask what better way to start a musical venture than to create a song that celebrates the women in our lives? January 20th 2014, Jamaica, Queens - Across the street from one of south Queens' most progressive and largest mega-churches Allen AME Cathedral, is a soulful epicenter of a different sought. Directly across the street on Merrick Boulevard is the home of A Plate of Soul Restaurant. Although South Queens has other soul food eateries, which are mostly takeout places, A Plate of Soul, also offers a cozy cultural inspired ambience. The owners of A Plate of Soul restaurant have roots in the legendary Silvia's Restaurant and soul food franchise. Nikko Holman, one of the owner operators of A Plate of Soul, is the grandson of pioneering restaurateur Silva of the eponymous Silvia's Restaurant fame. Mr. Holman ironically is low key and unassuming about his mom's legacy in that he is determined to create his own reputation and brand in the restaurant service industry. Nikko can be seen many evenings, like other savvy restaurant owners, mixing it up with patrons and engaging in uplifting conversations with guests. A Plate of Soul Restaurant sports a cultural interior which embodies a positive testament to African- American culture. The waiters are friendly and courteous. The restaurant has some refreshing and tasty drinks they offer like the half-and-half: half lemonade and half iced tea. A Plate of Soul, really makes its mark cooking traditional soul food favorites like fried chicken, yams, collard greens, and fish and chips dishes with savory flourish. They're known for making staple dishes from the African American palette while preparing meals with the aplomb of being crispy and not greasy. Unlike many soul food restaurants A Plate of Soul even makes a very delightful turkey burger. Also a great dessert to treat yourself to is the red velvet cake and peach cobbler. It is nice to see a revival of tasty soul food in the area where you can relax and converse with friends or loved ones in a nice cozy atmosphere. A Plate of Soul's arrival and future success bodes well for upward moving success in the economic development of South Jamaica Queens. 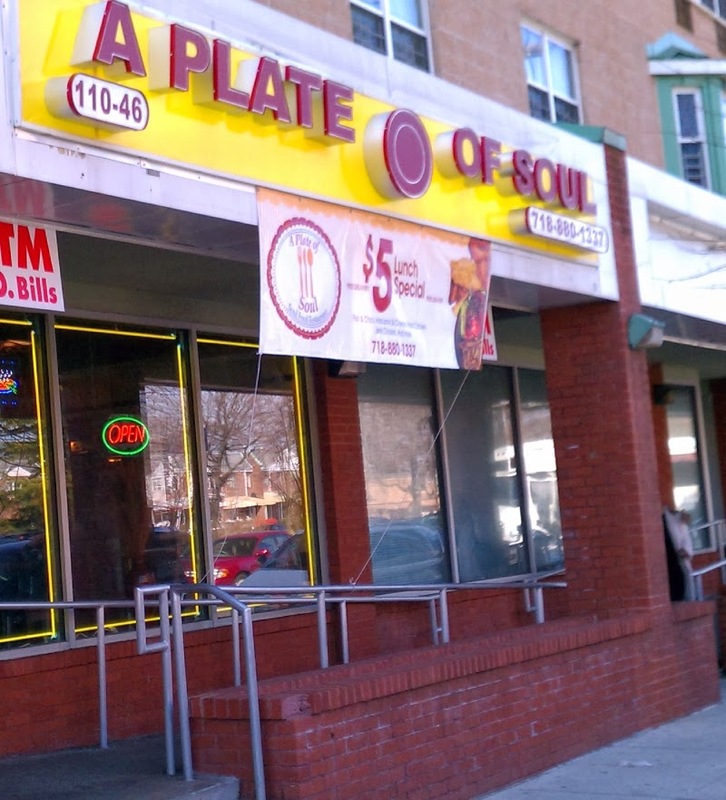 A Plate of Soul is located at 110-46 Merrick Blvd. Jamaica, NY 11433. For business hours contact 718-880-1337. The Restaurant's menu can be seen at http://www.PlateofSoul.com. The mission of the Southeast Queens Scoop Blog is to cover the news, business, and cultural events of Southeast Queens in a current digital format. While we have a number of print newspapers that cover area news, we really don't have a digital media source that uses more recent technology and promotional techniques to communicate the areas news. This is why our slogan is "Streetwise Digital News." We want to create an organic news and event source from the perspective of the residents of Southeast Queens, with advanced digital technology. Southeast Queens is an important historical area especially to African Americans for a number of reasons. It is the 1st (and only) large county in the US where Blacks have higher aggregate incomes than ethnic groups in the surrounding areas (according to the US Census and the NY Times). It also was the northern home for jazz artists and other entertainment luminaries. Famous Jazz Artists and Entertainers that lived in our area at one time or had homes here are: Ella Fitzgerald, Lena Horne, Fats Waller, Mercer Ellington, Count Basie, John Coltrane, James Brown, Miles Davis, LL Cool J, 50 Cent, Run DMC, Q Tip, and many many others. Sport stars that lived in our area are the legendary Joe Louis, the amazing Babe Ruth, pioneer Jackie Robinson, Roy Campanella, Floyd Patterson, and Bob Cousy just to name a small number. Business Luminaries or companies from the area are Russell Simmons, Damon Johns and the founders of FUBU. Civic greats that lived here are W. E. B. Du Bois and Roy Wilkins. In short, Southeast Queens area is a historic area. In the past our area has made history and we are certain our area will continue to make historic progress and news in the future. The Southeast Queens Scoop will make certain we cover our news.